The beginning of the year brought fantastic news for one of our recent technological projects, Samsung 360 Social Wall - technological platform pivoting Samsung S7 campaign. The campaign for RIO Olympics – led as a whole by our French partner and a well-known Willie Beamen Agency – was awarded with two prizes. Being invited by Willie Beamen Agency as technology partner, we were responsible for creating Samsung 360 Social Wall - the digital platform for the huge promotional campaign of Samsung S7 blended with the company’s RIO Olympics sponsorship. The promo concept offered prizes of brand new Samsung S7 models for the most interesting social media publications concerning S7 and 2016 RIO Olympics. First – for the time of the campaign, we created only a desktop and Mobile application, which collects and presents a huge number of Samsung S7 Twitter, Instagram, hashtagged, etc. publications in an interesting and modern form of the digital interactive wall. And allows to browse them, click to enlarge and read or even connect straight to the users social media profile. Then, we thought that it is a perfect material to apply for the VR glasses „Samsung Gear” in-store presentation – engaging, closer to the client and building familiarity. And we transformed the Samsung Social Wall into a VR solution. 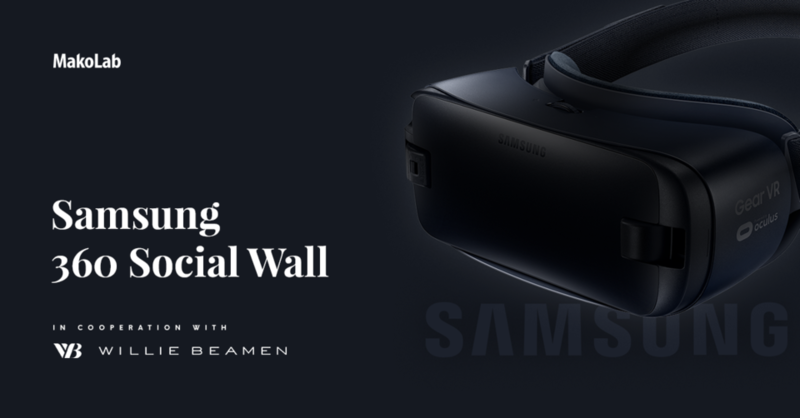 We congratulate our partnering agency Willie Beamen and are proud to have participated in this success as a technological partner for Samsung 360 Social Wall.